Abelia 'Sweet Emotion' is a hardy introduction from Proven Winners. 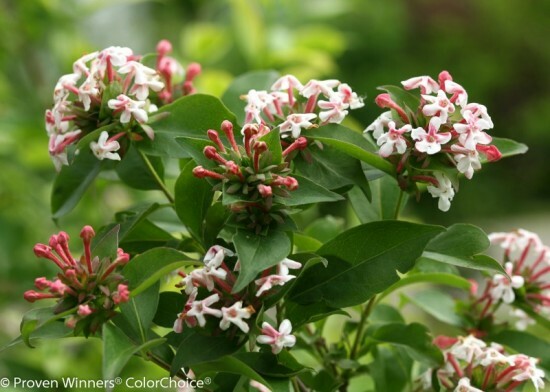 It's also the most fragrant of any abelia, with white and pink spring blooms that perfume the air with the scent of jasmine. Add in its elegant habit, attractive seed heads, and orange fall foliage and you have the perfect shrub for a mixed or shrub border. Abelia mosanensis 'Sweet Emotion' is an easy plant to grow requiring average, moist but well drained soil on the acidic side. It will grow in sun to part shade. As a young plant it has a somewhat rangy habit so pinch the growth tips after blooming to shape it and keep it growing tightly. Once it is full grown light pruning to keep it shaped is all that is required.